So how did a young Vietnamese girl who came to Plano, Texas, by way of France-without being able to speak a word of English, turn a dream of connecting women worldwide into a fulfilling career and highly profitable and sustainable company that has changed the lives of so many? 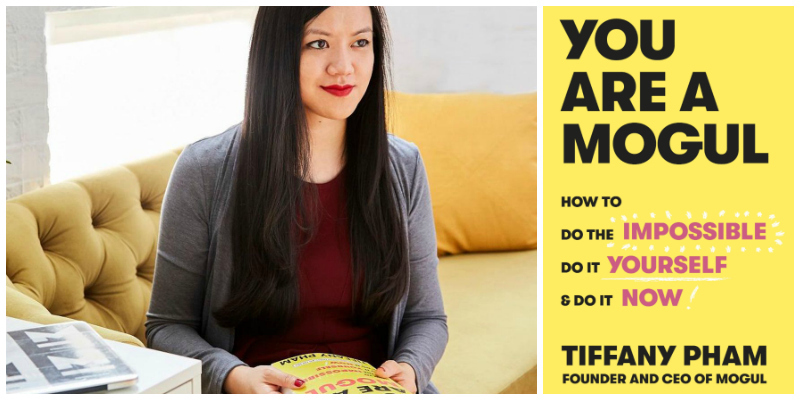 In You Are A Mogul, Tiffany shares her story of how she became one of the most successful millennial entrepreneurs, and offers specific, actionable advice that covers everything from overcoming self-doubt, to pursuing side-hustles, to crushing it at life and work by over-delivering, all while remaining your authentic self. Substantiating these lessons with her own life story (including all her mistakes along the way), Tiffany also shares insights from ten of her friends and most powerful moguls worldwide, including Nina Garcia, Star Jones, Rebecca Minkoff, and more. Bold and daring like #GIRLBOSS, with the business savvy of Lean In, You Are A Mogul addresses the ever-growing shift in our society - very few of us will work for one company for our entire career and, more than ever, there is no one straightforward formula for a "good life”, personally, or professionally. To be successful, we have to be agile and flexible, but also incredibly strategic. You Are A Mogul is an indispensable road map to this kind of life, one that is demanding and challenging, but also exciting and full of opportunities, if you know where to look. My journey, and the journey of Mogul, was fueled by unending determination and resilience, no matter how challenging the circumstances; a perpetual desire to learn more, become more; and the knowledge that, step by step, you can do anything you want to do and be anything you want to be. Whether you’re fourteen or forty, it’s never too early or too late to dream big. When you have a passion to keep you going, and role models to inspire you, there is no limit to what you can do. We all have the power to create something great, whether it is a social enterprise, a nonprofit, beautiful artwork that inspires the world, or technology that makes people’s lives easier. I share my story and the story of Mogul so that you can apply every lesson I have learned to your life today, accelerating your own growth, personally and professionally, and reaching your goals sooner than you thought would ever be possible. Tiffany Pham is CEO of Mogul, a global platform enabling women worldwide to reach their goals and realize their full potential. A coder, she developed the first version of Mogul, now reaching across 196 countries and 30,470 cities. She is the bestselling author of YOU ARE A MOGUL and GIRL MOGUL. Tiffany was named one of Forbes "30 Under 30" in Media, Business Insider "30 Most Important Women Under 30" in Technology, ELLE Magazine "30 Women Under 30 Who Are Changing the World," Good Housekeeping "Awesome Women Award" Winner, "Alice Paul Equality Award" Honoree, Cadillac "IVY Innovator" Award Winner, SmartCEO Magazine "Smart CEO Award" Winner, "Innovation & Inclusion Award" Winner for Social Entrepreneurship, NY Business Journal "Woman of Influence" Winner, Tribeca Film Festival "Innovation Award" Fellow, and SE "Top 100 Social Entrepreneur.” Tiffany is a Judge on the TLC TV show "Girl Starter," produced by Al Roker, and Co-Host of the show "Positive Pushback" from the Producer of The View. She speaks on a quarterly basis at the United Nations to present gender policy recommendations, as well as MSNBC, Bloomberg, Viacom, Microsoft, AOL, Prudential, SXSW, Harvard Business School, Wharton Business School, Scripps Research Institute, Paris, Berlin, Vienna, Panama & Dubai. She is a graduate of Yale & Harvard Business School.